While we would love to take our watercolor block with us wherever we go, there are simply just some scenarios where a sketchbook would be a better fit. In today’s guide we are going to review the best watercolor sketchbooks that will perfectly complement both your watercolors and active lifestyle. 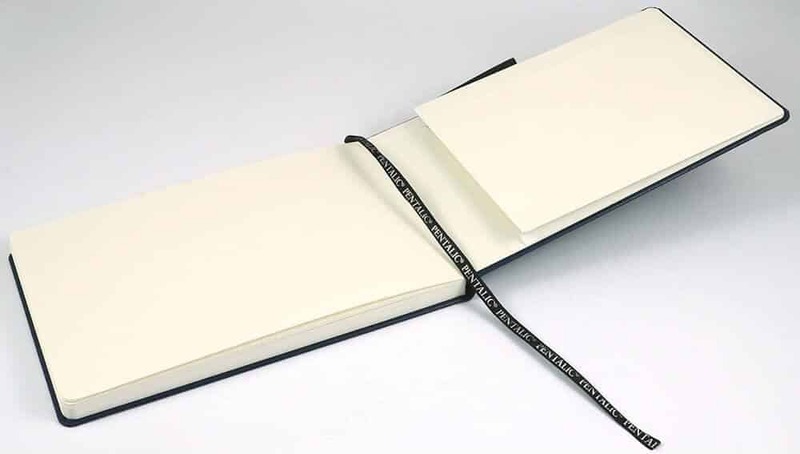 You see, the perfect sketchbook isn’t just determined by the paper that’s within (although that’s incredibly important), nor is it judged by the material of which the book was bound, instead it’s a combination of several factors. From our research, we found that the Pentalic Aqua Journal displayed many of the key features you need in order to get great results (brush clip, back flap storage, sturdy cover, and an uncompromising paper weight of 300 gsm). First starters we deep dive into the reviews. There you will find an in-depth analysis of some great (and not so great) watercolor sketchbooks. While some of the sketchbooks we reviewed are the market leaders (based on our research of various forums and review data), we also looked at some smaller brands as well. After the reviews, we put together an appendix section that goes over in detail some of the key components you should always be looking out for when selecting a watercolor sketchbook. Unlike your standard sketchbook that may be designed for graphite, charcoal, or some form of mixed media, watercolor sketchbooks are completely unique in their own right and require very key components in order to serve the watercolorist well. 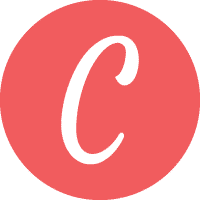 Unlike other companies that review several different products categories both related to art and not, we are artists here to serve you and only you, the artist. We understand what makes a product good (such as a watercolor sketchbook) compared to one that simply misses the mark. We did not get paid directly by any of the companies mentioned in this guide. Therefore, you can expect to read our candid thoughts about each one of the sketchbooks and why they may or may not work for you. To learn more on how we operate, please visit our privacy and terms page (also listed at the bottom of every page on this site). Unlike some paper companies that have been around for over 500 years (see Arches – makers of fine watercolor paper), Moleskine is the relatively new kid on the block. Created in 1997, Moleskine has quickly become one of the most popular names in the stationary world. Makers of diaries, notebooks, and yes, watercolor sketchbooks, their products are often highly revered by anyone who uses them regularly. But what really sets the Moleskine watercolor sketchbook apart from the rest of the entrants on this list? With a spine that opens nearly completely flat, you can concentrate easily on your painting rather than managing pages that want to close shut. One of the best (and perhaps underrated) features of this book is the back pouch that is affixed to the back cover. Able to easily store small and compact supplies (i.e. a few small watercolor tubes or a very thin watercolor pan set), you can keep everything contained when you go out to make your watercolor sketch. Unlike some of the other watercolor sketchbooks featured in this guide, the Moleskine paper does come in a bit light. Instead of the standard 300 gsm we are so accustomed to in our traditional watercolor paper, the weight of the pages in this book are a light 200 gsm. This means that wet on wet paintings may be a bit too much for the backbone on this paper. However, if you plan on doing light sketch work, the 200 gsm still should be more than sufficient. 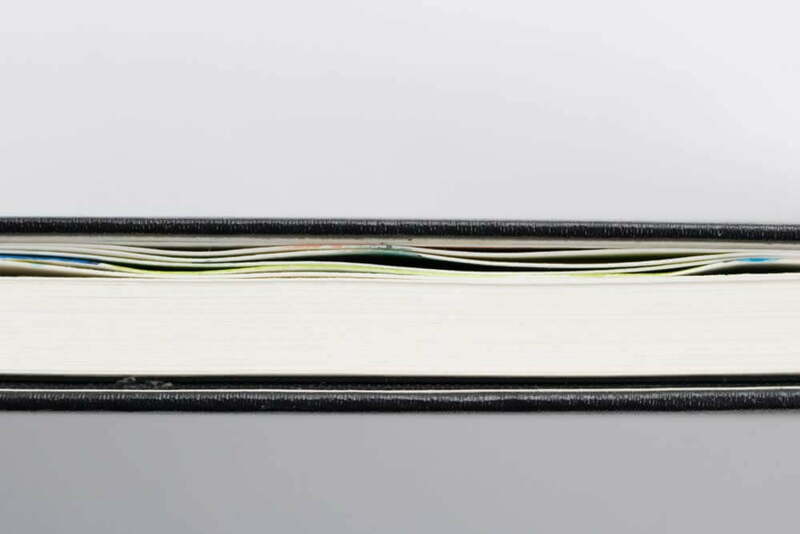 Lastly, the one other feature that we really liked about this sketchbook was the elastic band. It’s firm grip on the front and back cover shouldn’t lose its strength with age. Not only will it help to counteract the warping, but will keep all your pages in crisp shape. Bottom Line: The Moleskine watercolor sketchbook, while light in its paper weight, makes up in its smart design as sketchbook made with the watercolorist in mind. Surely worth the increased cost compared to others reviewed. What Global Art Materials (GAM) really brings to the table with their watercolor sketchbook is the options available for watercolorists. Furthermore, all the above options come at varying price points as well. Not only will this give you options to fit your preferred sketch style (i.e. the pocket panorama is perfect for landscapes whereas the large portrait could be great for city scapes with towering buildings), but its compact size allows you to bring several with you while on the road. When looking at the paper, you are going to see a lot of similarities with the Moleskine Watercolor Sketchbook we reviewed above. Rated also at 200 gsm, this notebook will be apt for sketches rather than washes or other wet on wet techniques. Expect to see some slight buckling or warping on the pages that get a bit too wet. Also worth noting is that the paper does have enough weight to ensure that the watercolor doesn’t seep through to the other pages. Regarding the manufacturing process of the paper, GAM states that this paper is cold pressed and should have ample texture that will quickly absorb your watercolors. Lastly, the GAM line of watercolor sketchbooks feature a clear plastic back pocket. While not as elegant as other sketchbooks we looked at, it can help to store loose leaf paper and other notes that you may make while out in the field. 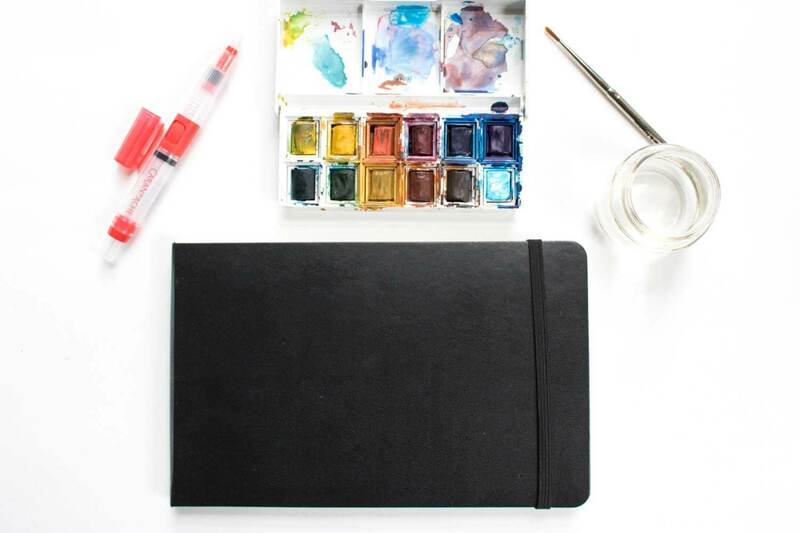 Bottom Line: The number of sizes that are offered by this watercolor sketchbook are one of its biggest selling points. The cold pressed 200 gsm paper quality will perform well under most conditions. 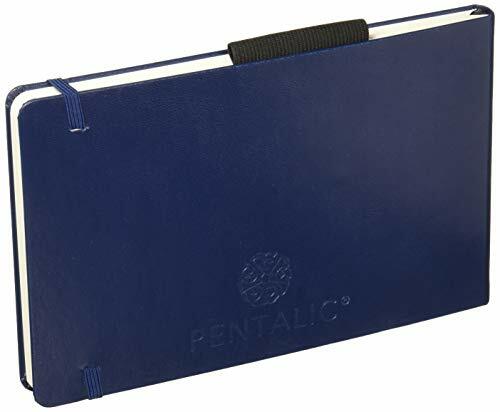 One of the few 300 gsm watercolor sketchbooks available on the market, this line of products by Pentalic are meant with warm reception from the watercoloring community. Therefore, you will be able to select the perfect sketchbook to fit your needs rather than you conforming to the manufacturers design. 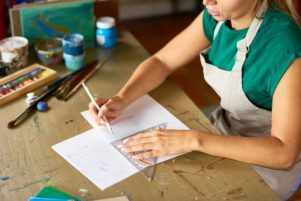 For artists who want to preserve their work long after they finished, the paper contained within the Pentalic line is acid free and holds a neutral pH. However, from our research we couldn’t verify if the sheets were 100% cotton fabric. 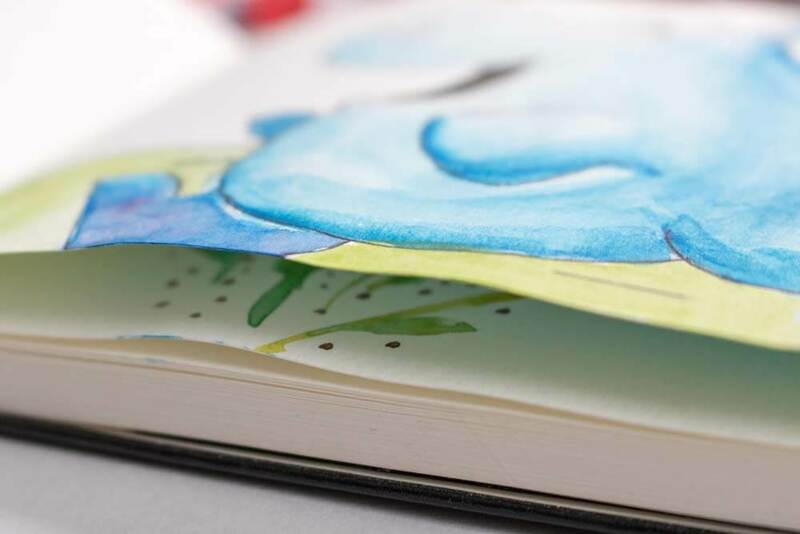 Of all the watercolor sketchbooks reviewed in this article, we did find that the Pentalic Aqua Journal rivals the Moleskine when it comes to design. Like the Moleskin, Pentalic sketchbooks feature an accordion paper pocket on the back cover. This back pocket becomes extraordinary useful when it comes to storing backup brushes, slim watercolor pan sets, and even some notes when painting en plein air. While the paper gsm sets this sketchbook apart, another detail that brings it a step further is the brush loop that is on the top of the journal. Able to store a single brush, it makes it even easier to travel with your supplies. While there could be some debate over its usefulness as the bristles of your brush will remain exposed to being frayed or damaged, the thought process given to this sketchbook is amazing. Bottom Line: An extraordinary watercolor sketchbook that checks all the boxes. It was designed for the watercolorist in mind and shouldn’t disappoint in the least. We think this is the best watercolor sketchbook currently available. Like Arches and Canson, Strathmore has been a staple to the art world for over a century. 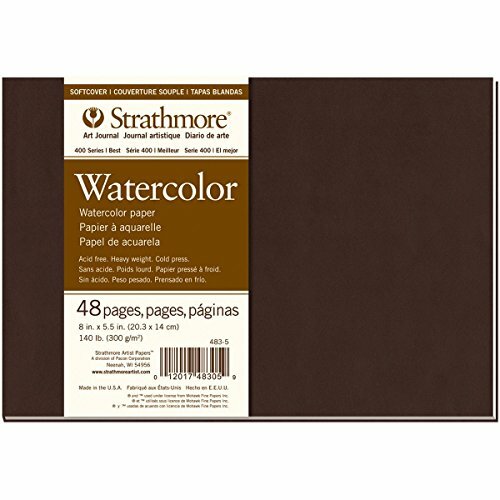 Maker of a very wide array of paper, Strathmore will be one of the most familiar names on this list when it comes to art supplies – especially for beginners. The 400 Series Watercolor Journal by Strathmore carries on this legacy in many ways. Most notably, this journal carries the 300 gsm paper weight that seasoned watercolorists seek. It’s unwavering and unbuckling design will make it apt for wet on wet paintings that display beautifully. However, unlike the 500 series of Strathmore papers that are derived from 100% cotton, purists out there may find the reliance on a wood pulp in this journal to be slightly lacking. But given that it comes in an extremely affordable price point, many artists will easily give Strathmore a pass. While the acid free 300 gsm paper weight is a sought-out feature by watercolorists, another less talked about benefit of this paper is going to be its binding. With some watercolor sketchbooks, the artist will find themselves constantly dealing with pages trying to return to their natural closed state. To counteract this, you must rely on a weight to keep the surface fully flat. We were happy to note that the binding of this Strathmore, while not ringed, is smyth-sewn which allows it to rest nearly completely flat – allowing you to focus on your painting rather than the book itself. Both of which come in a soft velvet-like cover bound. While this journal is advertised as having 48 pages, there are actually only 24 sheets in the book itself. Therefore, if you paint regularly you may want to pick up a few when checking out. Bottom Line: A reliable watercolor journal from a trusted name in the art world. The 300 gsm will be perfect for watercolors. Chances are that if you are looking to buy a new watercolor sketchbook, you are likely already familiar with watercolor paper that comes in sheet or pad form. As we talked in great detail in our review of the best watercolor papers, we stressed the importance of paper weight. Too light of a watercolor paper will be susceptible to warping when the piece dries. Secondly, if you are a watercolorist that likes to start with an initial layer of a wash, this warping will be much more pronounced. Therefore, when selecting a watercolor sketchbook, you will want to look out for ones that have a paper weight of at least 300 gsm (or 140lb). We and many other watercolorists have found that this weight is sufficient for most artists. 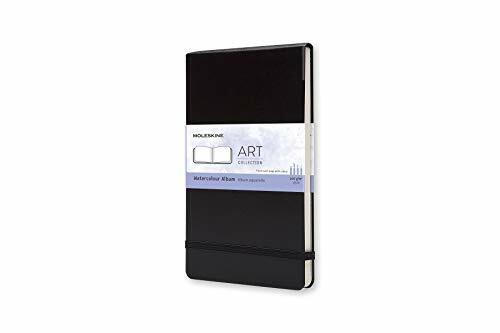 Now if you plan on just painting quick studies or light sketches in your book without the additional wash layer, then a sketchbook like the Moleskin Watercolor Album that has a 200 gsm should be plenty sufficient. 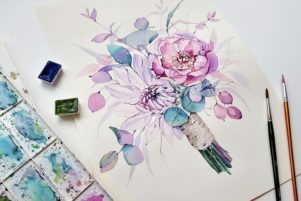 Unlike selecting watercolor paper for your studio, you will quickly find that your options are limited when deciding on a production method for your watercolor sketchbook. Nearly all sketchbooks that exist on the market fall into the cold pressed category. Cold pressed watercolor sketchbooks will exhibit the rougher texture that is perfect for watercolors. In addition, their high absorbency pages will ensure that the pigment and water doesn’t leak through to the other pages within your book. For watercolorists who are looking for a hot pressed watercolor paper, you will have to substitute and go with a mixed media pad that has ample weight to it. While not reviewed for this article as it goes beyond the scope of selecting a proper watercolor sketchbook, we would recommend checking out a product like the Bellofy Mixed Media Sketchpad. Now for those watercolorists that love rough or handmade watercolor paper that has the traditional deckle edges, then our best suggestion will be to make it yourself. While watercolor sketchbooks may be used by some as a primary surface for their watercolors, it bears repeating that these are secondary surfaces. A properly stretched watercolor paper that has ample weight will always out perform a watercolor sketchbook. However, unlike the large watercolor blocks or pads that are confined to the four walls of your studio, watercolor sketchbooks are great for plein air painting. 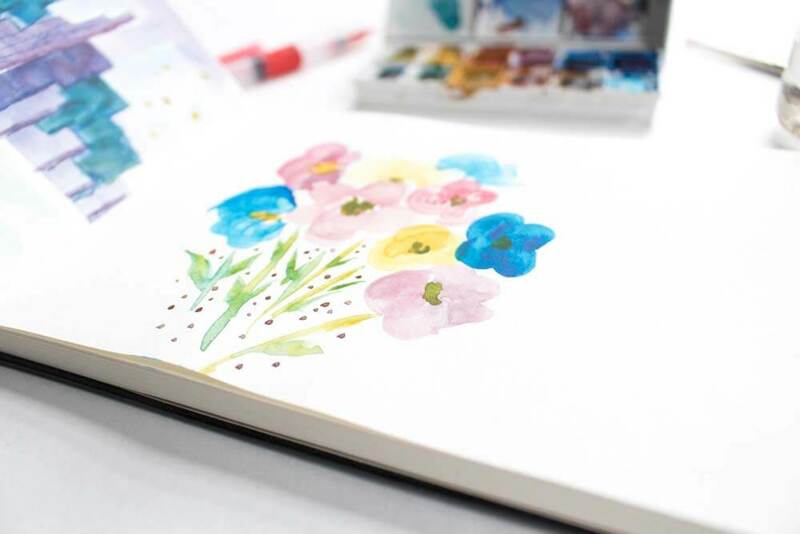 Whether you become a fixture at your local coffee shop, sit on the steps of your local city hall, or simply want to capture the essence of your weekend hike, watercolor sketchbooks are great for these scenarios. While watercolor sketchbooks provide unparalleled portability, if you find it just too restraining from either a scale perspective or that washes become more difficult due to warping, then we would suggest taking a look at a smaller watercolor block. 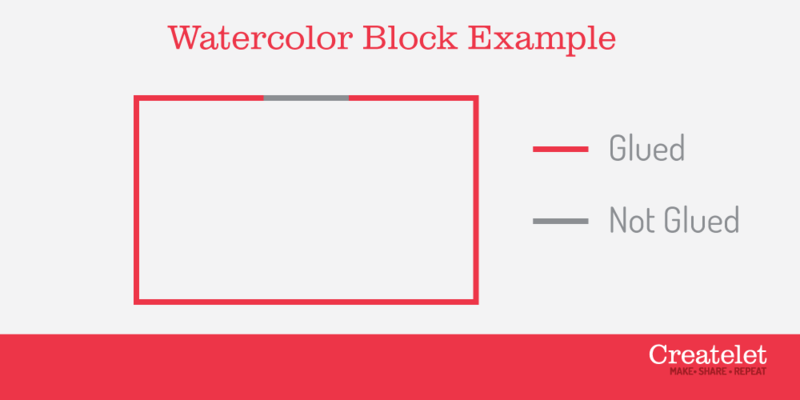 We would recommend going with the Canson Montval watercolor block for this scenario. Not only does the paper come in block form, but it’s also is 300 gsm and is only 4” x 6” – extremely comparable to all the other sketchbooks mentioned in this guide. Also worth noting is that the Canson Montval comes with only 15 sheets of paper. Therefore, it won’t be too bulky to paint on. 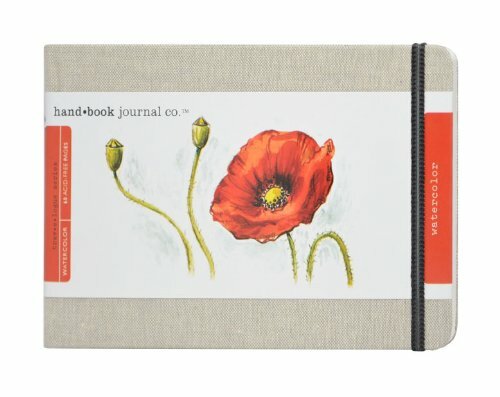 By and far the best option to purchase a watercolor sketchbook will be online. The largest online retailers including Amazon, DickBlick.com and Jerry’s Artarama provide countless choices for you to select from. When shopping locally, we found that the big box craft stores had surprisingly very little variety when it came to watercolor sketchbooks. However, we were able to get our hands on the Moleskin Watercolor Sketchbook at a local Staples (albeit for a few extra dollars when compared to the prices we found online). 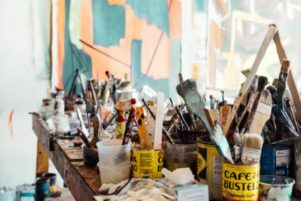 As you may already be familiar, some local mom and pop art stores around your area may also have a few options for you to browse – be sure to call ahead before visiting to make sure.